Serene and exotic, voices of beauty, tales of minds, another age, another world … singer-actor Cher’s Hollywood Penthouse is a world immersed in the meditative calmness of Oriental and Indian elements befitting any Maharani. All those who admire Cher’s bold and gothic profile would be surprised by her new home which is like Buddha’s meditation garden – an oasis of calm, tranquil beauty. The penthouse perched high above Los Angeles, is akin to an alembic which one passes through, to reach the silk routes of India and the Orient. 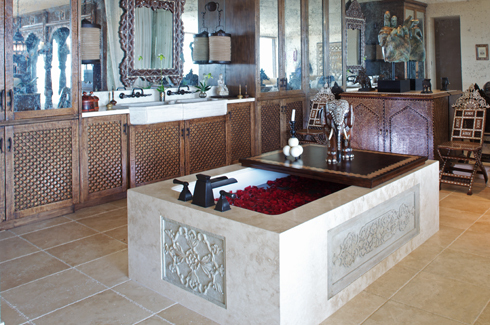 Designed by her friend and famed interior designer Martyn Lawrence-Bullard, this sanctuary was created with the tag line: an Indian fantasy – ethnic, spicy, and romantic. Cher had a clear brief, ‘I want to feel like the first wife of a Maharajah!’ – She wanted an ‘Indian fantasy’ and Bullard gave her a space that was her own royal boudoir. He started by bringing down walls to transform a 4,000 square feet twelve room duplex into a two loft open floor volume connected by a spiral staircase. 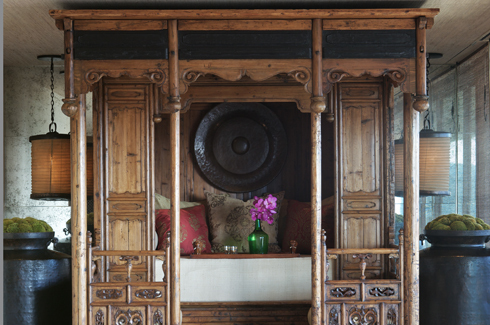 Small private nooks were inserted, like jewels in a crown, to make the huge space more homely and personal. Colours do not pervade Cher’s home, since she feels that a neutral palette is easier to live with, and hence the spaces are more about restraint in tones, textures and patterns, all in pied combinations of ivories and whites. When Cher announces she needs to be a Maharani in her bedroom, you give her exactly that! 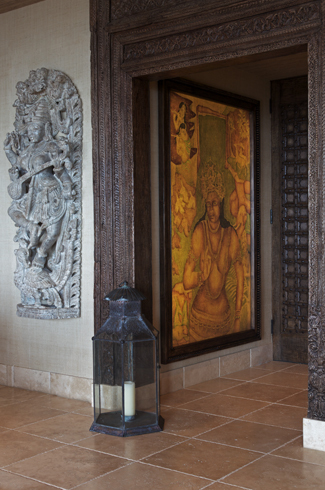 The entrance is marked royally by a 19th century intricately carved Indian door which leads you into a massive bedroom. As soon as you step inside, a picture frame of the bed and its background catches your eye. 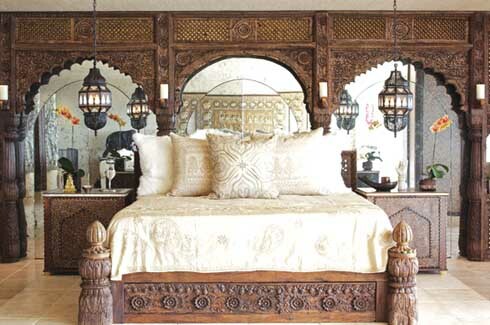 A large Californian king-size bed raised on a manicured platform is given the backdrop of an 18th century Rajasthan archway with mirrors within the arches. The setting is no less than any of the sets that Cher would have performed in; only this setting converses in hushed tones of ivory, beige and brown and screens the entry to her dressing room behind, placed regally on a manicured platform. To create this large chamber, a series of smaller rooms were broken down to become one large space further magnified in scale by the mirrors within the arches, conjuring up an image of a never ending room in an Indian palace. Like in all other projects, Bullard designs the rooms, spacing and zoning to reflect the owner’s persona and way of life in every tile and seam. The bedroom extends to the living room and a meeting room and further ahead into the terrace which is how Cher likes to entertain. 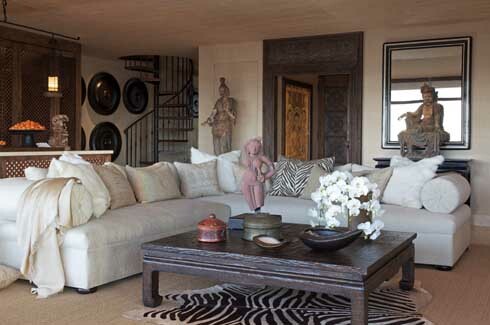 Beige wraps the living room in eloquent simplicity, rich in oriental textures, fabric and wall décor. The only colours infused into this ivory setting are contributed by orchids which smile temptingly against the corded raw silk white sofa designed in-house, sitting calmly on a stone floor. Across the sofa the view of the kitchen is shielded behind an ornate hand carved wooden screen and oriental fixtures grab the focus. For a taste of the genteel breeze and lush sunshine, walk down to the terrace which is dressed in Indian flavours, complete with an Indian daybed and spice jars serving as décor pieces. 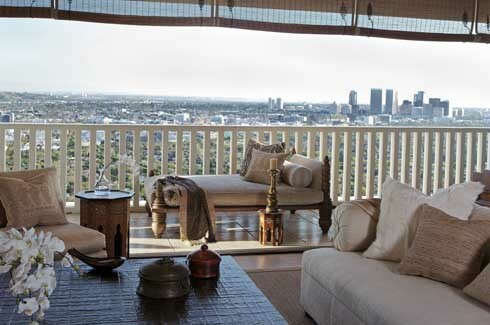 Succumb to the comfort of outdoor fabrics again in shades of beige and ivory and bask in the sunny rays of the city of Los Angeles whilst enjoying the stunning view from high up above… all this of course if invited by Cher! Through all the volumes of the penthouse, elegant décor holds court, allowing peace to brim over creating expanses that are a decorative measure of Cher’s ever alluring, exciting life – the result of combining her ideas with Bullard’s distinctively strong command of proportion and scale and his deft hand with colour and pattern and an exuberantly global sensibility.